wings flapping and loud shrieks from giant sea gulls. Our exclusive acrylic painting selection brings these lovely noises - and all the memories, sensations and longings that come with them - to your living room or your office. Through summer motifs, you can bring yourself and your visitors closer to the seaside, the beach and the warm sunshine that can be felt on every inch of your skin. Not only will you smell the scent of salt in the air, you can almost feel the salt crystals in your hair and taste it on your sun-kissed lips. This is the atmosphere that we can help you to create in your living and working spaces, for art from KunstLoft is all about expression and emotions. We can easily forget who we are when we look across the sea and trace the lines that stretch ahead endlessly. Apart from its glorious vastness, the sea also fascinates us with its fickle nature. Right now it may be calm and is the ideal backdrop for your thoughts to meander as you lounge comfortably in the living room or for a couple to share some intimate moments. The next second, however, stormy waves begin to slosh and crash onto the shore, revealing the unfathomable power of the deep blue sea. Our artists, too, are impressed by the sea’s many faces and they strive to capture its different aspects on the canvas. We are convinced that the different shades of blue in a canvas painting can reflect the character of its owner. Show the varied sides of yourself with a handmade painting of the sea. Do not let traditions and conventions hold you back - let your personalities pour forth like frothing waves! Paintings of the sea reproduce both the immeasurable forces of nature as well as the breathtaking vastness of the seas. This is illustrated by our artists on the cavasses with lighthouses, beaches and coastal flora and fauna. 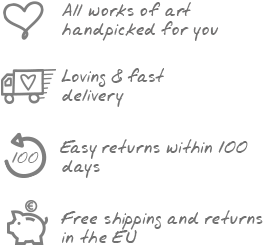 Our acrylic paintings are also varied in terms of size and price. You can surely impress others with an XXL oil painting, but a smaller and more affordable piece will equally transform your living room or hotel and prove your excellent taste in art. Have a look and find some inspirations in our sale section! The sea has an ever-changing temperament. It can be calm or toss with rage; shimmer in azure blue or turquoise. Handmade paintings mirror the character of their buyers. You can display your versatility and expressive personality with the selection of a sea themed artwork.